The Bridge Community Shop, based right in the centre of Stocksbridge, is a fantastic community project set up and run by Churches Together in Stocksbridge and Deepcar. It offers a great service providing new homes for pre-used clothes and furnishings, books, music and all the things you would expect to find in a normal charity shop. But it is much more than that….. It recycles everything it can’t re-use…..
And all its profits are channelled back into local community groups in the Stocksbridge area. A local project at its best. 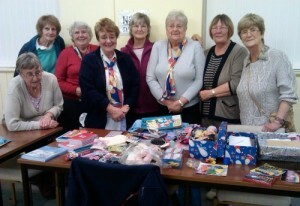 It is also the base for some other activities, including the Christmas Parcels project. You can see some of the volunteers at work on this project here.